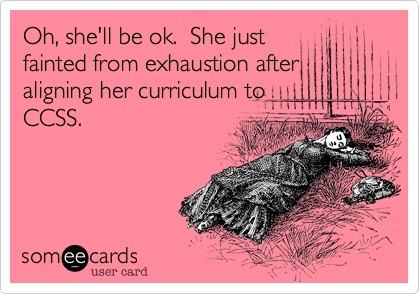 It has been a great way to re-energize the way I approach ELA and Math and review (and maybe recognize for the first time!) the *vast* amount of terms and concepts that are required for our students to know. 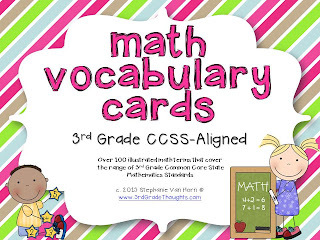 A few months ago, I made 3rd Grade CCSS-Aligned Math Vocabulary Cards and I loved seeing my kids use them in Math Centers throughout the year. Believe it or not (although, I know you'll believe it as teachers! ), this packet is currently at over 200 terms! These, too, are defined by a simple graphic and many of them match the graphics found on my packets (like my nonfiction posters). 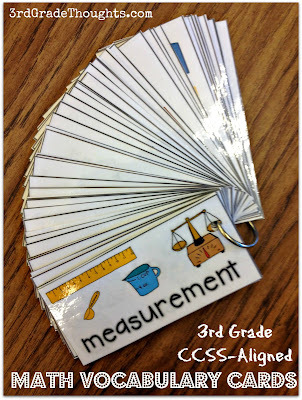 Each of these cards are approximately 2 1/4" by 5", so they are easy to laminate and throw on a binder ring (like I've shown), or you can also make a word wall for your classroom. 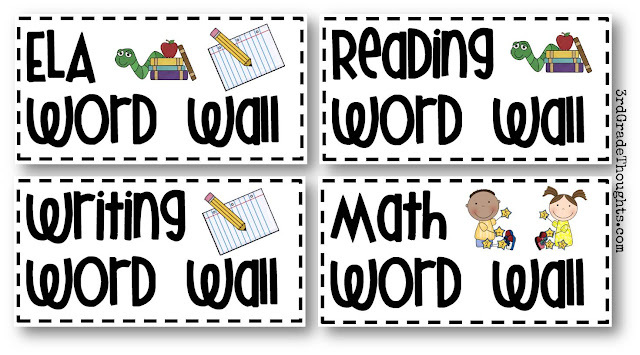 For me, as a third grade teacher, it seems a bit easier to make a vocabulary-style word wall since these words will be extremely helpful throughout the year for students of all levels. These are small enough to take up not much wall space, but clear enough that the graphic can cue your kids to the meanings. If you're interested in these cards, you can find them in my TpT Store and TN Store by clicking the links below each picture. 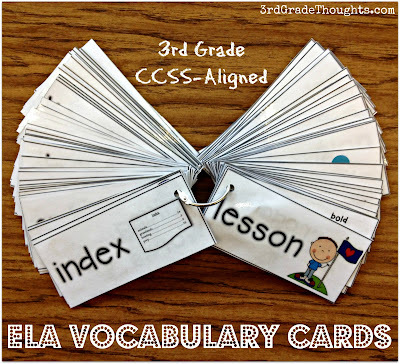 I hope this helps you as you become more comfortable with Common Core ELA & Math! Thanks for stopping by! Oh! I need to remember this for next year. I am teaching 3rd grade for my student teaching and am not sure what all I have available to use. Thanks so much, Misty! I found it so overwhelming (even after teaching 3rd for 7 years!) how many terms my kids are responsible for- these seemed to help keep it fresh in their minds all year long :) Good luck with student teaching! Those cards look awesome! Great work! 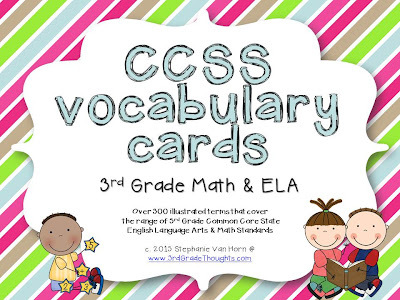 Oh, I wish you had these for second grade! I would definitely recommend downloading the Preview for both of them and see if the terms match up with 2nd's standards. I have a feeling the ELA ones will cover 2nd and even up to 4th quite well. Math may be tricky, so I may add that to my summer to-do list :) Thanks so much and let me know! These are great! I won't be teaching third next year, I'm actually not sure what I'm teaching yet, but if I'm in second or fourth I'll check them out to see if they may overlap! The ELA cards look great! The cards look awesome! I can't wait to print/laminate/use them next year with students! Oh these are awesome! Just added them to my basket, can't wait to use them with my kids next year, thanks.